Carter sharing his drone project with his peers. Fourth grade student Carter has a passion! 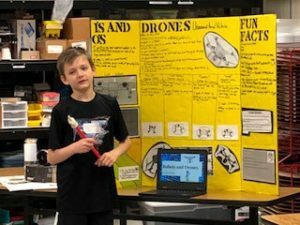 His goal was to design a drone with an outside rotating camera located in different places on the drone as well as redesigning the landing gear. This passion began as a G.T. project with an unbelievable ending! Carter designed a prototype drone but he needed an expert’s opinion. I did some research and located an experienced “drone guy” name James Vau. Mr. Vau just started a business, Drone World, and deals with both drone cameras and racing drones. Carter did a phone interview with Mr. Vau. He developed questions in advance and Mr. Vau’s replies fueled Carter’s growing excitement. Soon after the interview, Carter received an invitation from Mr. Vau asking Carter to do a presentation about his drone at the Lone Star Flight Museum in Galveston. Imagine a 4th grade student presenting his passion at a museum! I want to share the excitement and joy expressed by my student getting the opportunity to pursue a passion. Truly, Klein’s Promise to Purpose is a BEST DAY EVER for a student with a passion. I look forward to empowering more students to find their passion in the years to come.